This post contains affiliate links for which I receive compensation. My sister, Mary's very first quilt 1998. Bias triangle for the star. 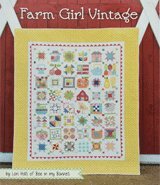 After she finished piecing the star and the black field around it she gave up, packed it away, SWEARING NEVER TO QUILT AGAIN. Many years latter on one of my trips to visit her in Massachusetts, she dug out the quilt she had started years before, and gave it to me. 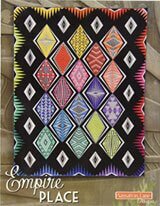 I finished the boarders, designing the outer boarder to enlarge for a double bead. 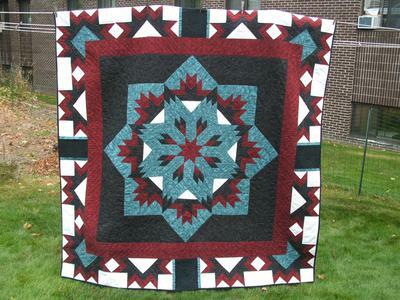 Ginger Cook, of Staford VA. long arm quilted. 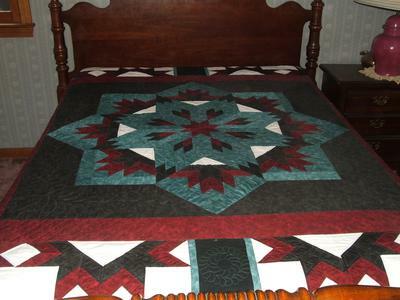 The quilt was finished in 2009, and given back to my sister Mary for her Christmas present. 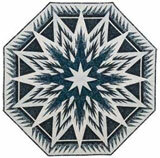 My sister Mary just started a Paula Nadelstern Kaleidoscope quilt. 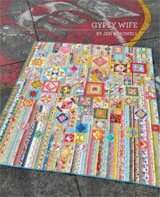 I hope she gets the Kaleidoscope done before she gives up and SWEARS NEVER TO QUILT AGAIN, and hands it off to me. UPDATE from the Editor: Ruthellen's sister DID finish her Kaleidoscope quilt and recently shared it with us. Click here to see it! This is such a wonderful story! I wish you were my sister, too! Lovely quilt. I love what you did with the border. I sure wish MY sister would finish my quilts for me! She's so lucky! Click here to return to Your Show and Tell. If you enjoyed this article and found it helpful, please let me know by clicking this button - thank you! 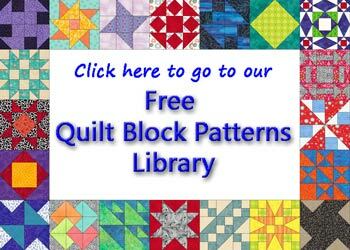 Quilt patterns, books and kits to tempt you! Also available as a kit. 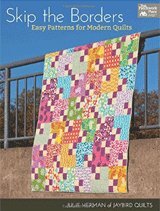 Includes top/binding fabric and pattern here. I understand that you will use my information only to send me StashTalk.